(815, Alexander Posey Collection, OHS). Before his untimely death at age thirty-four Alexander L. Posey, Creek poet, humorist, and journalist, became nationally and internationally known for writing political satire in what became known as the Fus Fixico letters. Posey was the eldest of twelve children of Lewis H. Posey, of Scotch-Irish descent, and Nancy Phillips, a full-blood Creek and member of the prominent Harjo family. 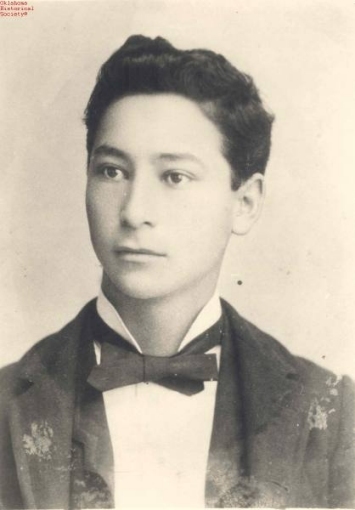 Born August 3, 1873, near present Eufaula, Creek Nation, young Alexander learned from his parents the importance of his Indian culture, religion, politics, and education. Before entering Indian University (now Bacone College), at age sixteen, he had a private tutor and attended public school. In 1896 he married Minnie Harris, a teacher. They had three children: Yahola Irving, Pachina Kipling, and Wynema Torrans. The children's names reflect Alexander Posey's literary interests (Irving referred to Washington Irving, Kipling to Rudyard Kipling, and Wynema to the heroine's name in Creek author Sophia Alice Callahan's novel). In 1895 Posey served as representative from Tuskegee in the House of Warriors. During the next several years he worked as superintendent of the Creek Asylum for Orphans at Okmulgee and as superintendent of public instruction for the Creek Nation. He served as interpreter for the Dawes Commission and as secretary at the Sequoyah Convention. Best known for his literary works, he started composing poetry during his college years. As an admirer of Henry David Thoreau, in his poems Posey reflects his love of nature. Published under the pen name Chinnubbee Harjo, the verses appeared in Twin Territories: The Indian Magazine and the Eufaula Indian Journal newspaper. Although he accepted the need for social change, by writing the Fus Fixico letters he expressed the concerns of Indians wanting to continue the traditional ways. Published in the Journal, the letters presented the dialogues of fictional characters, Fus Fixico and his full-blood Creek friends, who discussed land allotment, tribal termination, and impending statehood, which would end their way of life. Posey's journalistic career began in 1892 when he wrote for the Indian University Instructor and served as the Bacone reporter for the Eufaula Indian Journal. In 1902 he bought the paper and served as its editor until he sold it in 1904. As one of the first American Indians during the early twentieth century to own a newspaper, he gained national recognition as a journalist who used wit and humor to interest his readers. On May 27, 1908, Posey drowned as he and a friend crossed the raging floodwaters of the North Canadian River on their way from Eufaula to Muskogee. Posey was buried at Greenhill Cemetery in Muskogee. Since his death, readers of his poem "My Fancy" have noted an eerie similarity to the poet's own demise. Edward E. Dale, ed., "The Journal of Alexander Lawrence Posey, January 1 to September 4, 1897, with Annotations," The Chronicles of Oklahoma 45 (Winter 1967–68). Daniel F. Littlefield, Jr., Alexander Posey: Creek Poet, Journalist, and Humorist (Lincoln: University of Nebraska Press, 1992). Daniel F. Littlefield, Jr., and Carol A. Hunter, The Fus Fixico Letters (Lincoln: University of Nebraska Press, 1993). Alexander Posey, "Journal of Creek Enrollment Field Party 1905," The Chronicles of Oklahoma 46 (Spring 1968). Minnie H. Posey, comp., Alex Posey, the Creek Indian Poet: The Poems of Alexander Lawrence Posey (1910; reprint, Muskogee, Okla.: Hoffman Printing Co., 1969). Jeffrey M. Widener, "From Bard to Speculator: Alexander Lawrence Posey and the Muscogee Nation, 1902–08," The Chronicles of Oklahoma 90 (Spring 2012). Linda D. Wilson, "Posey, Alexander Lawrence," The Encyclopedia of Oklahoma History and Culture, https://www.okhistory.org/publications/enc/entry.php?entry=PO019.